al fresco is the #1 chicken sausage brand in the U.S. They offer our all natural chicken sausage in dinner and breakfast varieties, all with 70% less fat than pork sausage and free of nitrites, nitrates, preservatives and artificial ingredients. 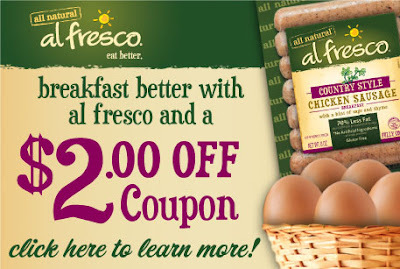 Sign up and you can grab a printable $2 Off Al Fresco Chicken Sausage Coupon.